According to the literature, occupational risks of transmission of Human Immunodeficiency Virus (HIV), Hepatitis C Virus (HCV) and Hepatitis B Virus (HBV) following a percutaneous accident during a dental procedure are respectively from 0.006% to 0.3%, of 0.5%, and from 0% to 2% (rate of HBV transmission has been decreasing since HBV vaccination is available [1-7]. Commonly, HBV is thought to be acquired through a cut in the fingers contaminated by the patient's blood or saliva. But nasopharyngeal secretions carry the virus, and the possibility of infection inter alia aerosol exists, even if it is very unlikely to happen . Although occupational risks are low, and although standard precautions of infection control exist, some dentists seem to be reluctant to treat patients with communicable infectious diseases (PCID) [9-11]. Indeed, a study led in 2015 in France by the association AIDES showed that a third of the dental offices included in the survey refused to provide care only to the people with HIV, most of these refusals being of a disguised type . Reasons of these refusals may be multiple. For example, dentists may overestimate the risk to be infected, which supposes a lack of knowledge in this field [13,14]. For some dentists, as for dentists from United Kingdom, it is forbidden to treat patients when the caregiver is HIV-seropositive . A survey from 2009 which assessed the behavior of dental students when treating patients with HIV concluded that students were judging their patients: their attitudes were worse when they estimated that their patient was responsible for their contamination . Going further, in some dental schools, the administration decided that students won’t have to treat patients with HIV, but will be encouraged . However, many professional codes and health-related laws stipulate that health professionals have to treat equally every patient, not regarding their social backgrounds, health status, religion, skin color, etc. (article R4127-211 of the French code of deontology for dentists and American Dental Association code of ethics [17,18]. Thus, any discrimination in the treatment of PCID is unethical and illegal. Moreover, these attitudes lead to a lack of confidence of PCID toward dentists and 33% of them hide their serological status from their dentist, fearing a change in their attitude . Many contradictions then appear: 1) patients knowing their serological status are in general the ones who take care of themselves by controlling their disease and so the ones with the smallest risk of contamination, and 2) PCID often need thorough examinations because their disease usually have oral manifestations, and so they are minimizing their chances by hiding their status. Furthermore, when it comes to their care, we know that PCID just want to be treated as any other patient and that patients do value having a dedicated, supportive and caring dentist who treats them as a person and not just as a patient . Considering the high proportion of dentists who still refuse to take care of PCID [9-11] and knowing that dentists should on the contrary encourage PCID to tell them their serological status for the good of their own oral health, it seemed interesting to observe the behavior of the next generation of dentists toward PCID. Do the recent information about the communicable infectious diseases ring a bell regarding their state of mind? Will they be discriminating in their practice, just like some of their predecessors? To answer these questions, we set up a study in the Dental Medicine and Oral Surgery Center within the University Hospital of Strasbourg (HUS), France. The study took place in the form of a questionnaire about the behavior of dental students while treating PCID. All of the 226 clinician students in dentistry (4th, 5th and 6th year of study in dentistry) of the Strasbourg University Hospital (HUS), France, were interrogated. The 4th, 5th and 6thyear students have been following hygiene lessons since the second year of their cursus. Standard precautions are discussed during the 2nd, 3rd and 4th year. Other hygiene topics (sterilization, waste disposal, dental unit maintenance, etc.) are discussed during the 4th, 5th and 6th year. Ethics is treated during the 5th year, dealing with deontology, conceptual underpinnings of dental practice, discussions around practical ethical issues and giving tools to students for them to manage human relationships. Microbiology is discussed during the 2nd, 3rd and 4th year. Specific items related to infectious communicable diseases are treated during the 3rd year. The daily care of patients during the 4th, 5th and 6th obviously participates as well to improve the overall knowledge of students. Students were recruited by sending an e-mail on their university mail containing the internet link to the questionnaire. In this e-mail, participants were informed that their responses will remain anonymous and that their participation was not mandatory but voluntary. Only one participation per student was possible. The objectives of the study were explained. Students were informed that answering the questionnaire meant that they approved the terms of the study. The questions focused on points such as stress, care, formation and knowledge, and were submitted through Google Forms (Google, Mountain View, CA). These topics were specifically chosen regarding the literature and the factors which could potentially play a role in the care of PCID. A first version of the questionnaire was submitted to a panel of 12 students to evaluate its relevance, as a pilot test. Once the panel fully understood the questions with no ambiguity in the possible answers, the study could begin. 1) Can you evaluate your stress (on a scale from 0 to 10) when you’re taking care of a healthy (here, «healthy» means «with no communicable infectious disease») patient? When you discover that your patient is a PCID? When taking care of a PCID? 2) Do you talk as much with a PCID than with a healthy patient? 3) Are you less likely to follow the care of a PCID? 4) Are you focused as much on the dental procedures when treating a PCID, or are you more focused on hygiene and security matters? 5) Can you evaluate your formation in hygiene and security when treating a PCID (on a scale from 0 to 10)? Your formation in ethics? The questionnaire was reachable from February 1st 2016 to April 1st 2016. The results were then generated by Google Forms in the form of tables. To compare the data obtained from 4th year students and 5th or 6th year students, a Student t-test has been used. To compare data concerning students’ knowledge about infectious communicable diseases transmission rate, a Fischer test has been used. These quantitative statistical analyses have been performed using biostaTGV (INSERM, Paris, France). Among the 226 students interrogated, 111 (49.1%) answered. 42 of them (37.8%) were in the 4th year of study, 34 (30.6%) in the 5th year and 35 (31.5%) in the 6th year. The stress of student’s increases when they discover that their patient is a PCID and increases even more while treating the patient (Table 1). These differences are extremely significant (p<0.001) when compared to the treatment of a healthy patient. As students go by in their study, they seem to feel less stress in these situations. Most of students (71.2%) make no differences when talking to a PCID, but most of them (63.1%) are unlikely to follow the care of a PCID (Figures 1 and 2). This is the case for 66% of the 4th and 5th year students, but only 57% of the 6th year students. 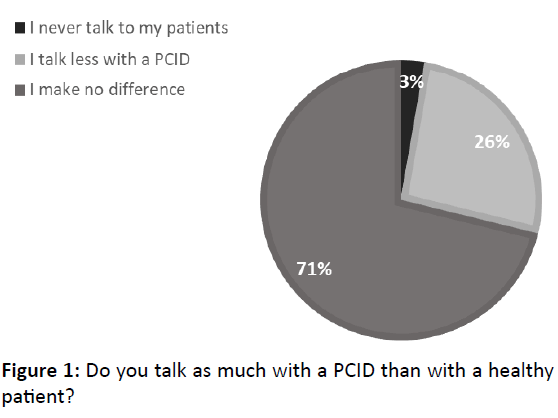 Figure 1: Do you talk as much with a PCID than with a healthy patient? 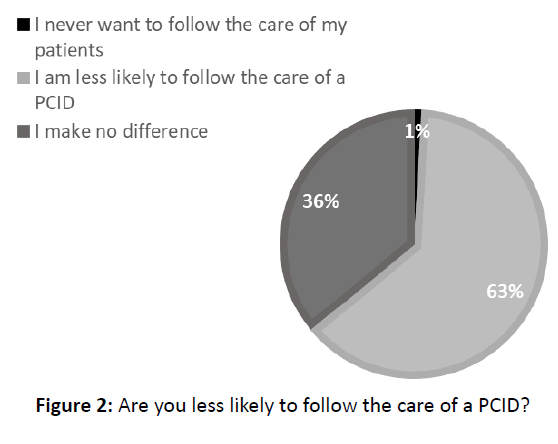 Figure 2: Are you less likely to follow the care of a PCID? Only 39.6% of the students keep the same concentration on their dental procedures while treating a PCID (Figure 3). This rate goes up to 49% for the 6th year students, and 35% for the 4th and 5th year students. Figure 3: Are you focused as much on the dental procedures when treating a PCID, or are you more focused on hygiene and security matters? Students’ formation in hygiene and security when treating PCID is evaluated at 6.8/10 but goes up to 7.9/10 for the 6th year students, with a significant difference (Table 2). Their formation in ethics concerning the care of PCID is evaluated at 5.2/10 but goes up to 6.3 and 6.4/10, respectively for the 5th year and 6th year students (Table 2). Finally, they are respectively 47.7%, 25.2% and 16.2% to know the occupational risk of transmission for HIV, HCV and HBV. A greater proportion of 6th year students gave the good answers, with a significant difference concerning HIV (Table 3). In general, dental clinician students don’t seem to be stressed when taking care of a patient (3.3/10) and the stress they feel when their patient is a PCID is not exaggerated (6/10), but it still almost doubles. This fact should be seriously considered, because the dental procedures are the same. There is something with PCID that makes the students stress, especially for the 4th and 5th year students. Considering that the 6th year students give the best evaluation of their formation and seem to have the best microbiology knowledge about the occupational risk of transmission of HIV, HBV and HCV, we could easily link the stress to the knowledge of the caregivers while treating PCID. The more informed they are about the diseases, the more serenely they can handle the care. This is similar to other studies conclusions and joins Nelson Mandela’s famous quote: «education is the most powerful weapon which you can use to change the world» [14,21]. Regarding their answers, 6th year dental students appears to be the most comfortable with PCID. Therefore, this third year of clinical traineeship (the 6th year of odontology studies) seems to be very useful for the initial formation of dentists. Indeed, the point is to make them armed to face every situation once their studies are over. Even if they are stressed by taking care of PCID, most of the students keep talking to their patients. This good point contrasts then with the fact that 63% of them don’t want to follow the care of PCID. That is ethically unacceptable and concerning, as it can generate behaviors such as refusals to PCID in their future private practice. The present situation could hardly evolve, and teachers in dentistry should really be aware and alert to these states of mind [9-12]. One of the reasons the students don’t want to follow the care of PCID might be that they think that the hygiene and security precautions are too restrictive. Indeed, many of them think that they have to wear a double pair of gloves, to wear a full-body gown, etc., participating to a discriminant feeling for the PCID. That is forgetting what the standard precautions are made for [1,22]. They have largely been implemented during the rising HIV/AIDS epidemic in the ‘90s and are designed to protect health professional because their use is meant to be universal, a large proportion of patients being unaware of their serological status. Therefore, there is no need to add supplementary precautions for common dental procedures when taking care of a PCID. Moreover, these patients know their status and are usually controlling the disease. The severity of the diseases should certainly not be taken too lightly, but the risks should not be overestimated. This was the first ethical issue we can discuss here. The second one concerns the concentration of students: when applying dental procedures to PCID, 60% of dental students are less focused on the procedures themselves. This could have an impact on the quality of the care that is given and thus, make a difference between healthy patients and PCID. We have to think about a solution to avoid discrimination toward PCID. Education is undeniably the first step. As their university formation goes by, dental students seem to be more and more satisfied with their formation in hygiene and security. The evaluation of the formation in ethics is quite low for the 4th year students. Actually, this teaching occurs during the 5th year, and the differences in the evaluation between the 4th year students and the 5th and 6th year students are significant. Consequently, the formation in ethics does have a positive impact on students. Nevertheless, our study suggests that the formation in ethics should be provided earlier in their courses, so that students would be armed and adopt better habits from the 4th year. There is an alteration in the relationship between dental students and PCID. Communicable infectious diseases stigma and discrimination persist in dentistry, whereas patients are more and more sensitive to human and moral qualities. Too many dental students still fear taking care of PCID while standard precautions protect them, and one of the keys to avoid it is education. The more informed students are about the diseases and their own protection, the more serenely they seem to handle the care. Hygiene, security, microbiology and ethics have an important role to play in the formation of the next generation of dentists when taking care of PCID and should be teached at early stages of their studies. Being comfortable with PCID is the only way to build a relationship of confidence, and thus to guarantee quality dental treatments. These two points are the ethical cornerstones of a willingness to become a dentist of quality. Thanks to Dr. Frederic Straub for his help on proofreading. Laheij AMGA, Kistler JO, Belibasakis GN, Valimaa H, de Soet JJ, et al. (2012) Healthcare-associated viral and bacterials infections in dentistry. J Oral Microbiol. 4:10. Lot F, Abiteboul D (2006) Contaminations professionnelles par le VIH, le VHC et le VHB chez le personnel de santÃÂ© en France. Rapport InVS. 1-16. McCarthy GM, Ssali CS, Bednarsh H, Jorge J, Wangrangsimakul K, et al. (2002) Page-Shafer K. Transmission of HIV in the dental clinic and elsewhere. Oral Dis. 8:126-135. Jagger J, Puro V, De Carli G (2002) Occupational transmission of hepatitis C virus. JAMA, 288:1469-1471. Evans BG, Abiteboul D (1999) A summary of occupationally acquired HIV infections described in published reports to December 1997. Euro Surveill. 4:29-32. Capilouto EI, Weinstein MC, Hemenway D, Cotton D (1992) What is the dentistÃ¢ÂÂs occupational risk of becoming infected with hepatitis B or the human immunodeficiency virus? Am J Public Health. 82:587-589. Hadler SC, Doto IL, Maynard JE, Smith J, Clark B, et al. (1985) Occupational risk of Hepatitis B infection in hospital workers. Infect Control. 6:24-31. Withers AJ (1980) Hepatitis: A review of the disease and significance to dentistry. J Periodontol. 51:162-166. Anderson BJ (2009) HIV stigma and discrimination persist, even in health care. Am Med Assoc J Ethics. 11:998-1001. Elford J, Ibrahim F, Bukutu C, Anderson J (2008) HIV-related discrimination reported by people living with HIV in London, UK. AIDS Behav. 12:255-264. Nostlinger C, Rojas Castro D, Platteau T, Dias S, Le Gall J, et al. (2014) HIV-related discrimination in European health care settings. AIDS Patient Care STDS. 28:155-161. Douay C, Toullier A, Benayoun S, Rojas Castro D, Chauvin P (2016) Refusal to provide health care to people with HIV in France. Lancet. 387:1508-1519. Seacat J, Litt M, Daniels A (2009) Critical issues in dental education: Dental students treating patients living with HIV/AIDS. J Dent Educ. 73:437-444. Grover N, Prakash A, Singh S, Singh N, Singh P, et al. (2014) Attitude and knowledge of dental students of National Capital Region regarding HIV and AIDS. J Oral Maxillofac Surg Med Pathol. 18:9-13. Shaw D (2008) Dentistry and the ethics of infection. J Med Ethics. 34:184-187. Rule JT, Veatch RM (1993) Ethical questions in dentistry. Chicago, IL, ed Quintessence. Ordre National des Chirurgiens-Dentistes (ONCD). Code de dÃÂ©ontologie dentaire. www.ordre-chirurgiens-dentistes.fr/code-de-deontologie/consulter-le-code-de-deontologie.html (consulted August 26th 2017). American Dental Association (ADA). Principles of ethics and Code of professional conduct www.ada.org/~/media/ADA/Member%20Center/FIles/2016_ADA_Code_Of_Ethics.pdf?la=en (consulted August 26th 2017). Centre RÃÂ©gionale dÃ¢ÂÂInformation et de PrÃÂ©vention du SIDA (CRIPS) (2007) Infection ÃÂ VIH et discriminations, dossier de synthÃÂ¨se documentaire et bibliographique. www.paca.lecrips.net/spip.php?article77 (consulted August 26th 2017). Sbaraini A, Carter SM, Evans RW, Blinkhorn A (2012) Experiences of dental care: What do patients value? BMC Health Serv Res 12:177. Taiwo OO (2014) Dental practice, human immunodeficiency virus transmission and occupational risks: Views from a teaching hospital in Nigeria. Ann Med Health Sci Res. 4:S94-S98. Wu S, Li L, Wu Z (2008) Universal precautions in the era of HIV/AIDS. AIDS Behav. 12:806-814.